UPDATE: Extending a limited discount to SDDialedIn.com readers only. Use discount code SDDICBB to purchase tickets for only $15 (Regular price $20/$30 day of event). SILO in Makers Quarter will be hosting their third Craft Beer + Bites for its Beer Week Edition on Thursday, November 13th, 2014 from 6 - 9 p.m.
Get your tickets here: http://bpt.me/891459. In collaboration with San Diego State University College of Extended Studies Business of Craft Brewing Program celebration, the event will benefit the San Diego Brewers Guild. Enjoy craft beer from 15 local breweries in a custom tasting glass along with grub from some of San Diego’s best food trucks (food sold separately). Tickets are either $20 in advance or $30 at the door for 10 beers (4oz pour). Additional indulgences of craft cocktails and wine will be available for purchase from Alchemy Culture Fare. While you enjoy your local craft beer and delicious food, stay a while and play a few games, because bocce ball, ping-pong, bean-bag toss and life-size beer pong will all be available to make for a great evening at SILO. Custom tunes from ZB Savoy and Andy Mauser Music will play all night long. Not only will there be beer, food, music and games but there will also be local fashionists with their great fashion trucks. Also enjoy live demonstrations of art by some of the best in SD and a home brewing station with Home Brewers. Transportation options will be provided by Brew Amigo tours and Social Cycle. Feel free to bring Fido, as leashed dogs are welcome at this event. Patrons must be 21+ to attend. See you there! 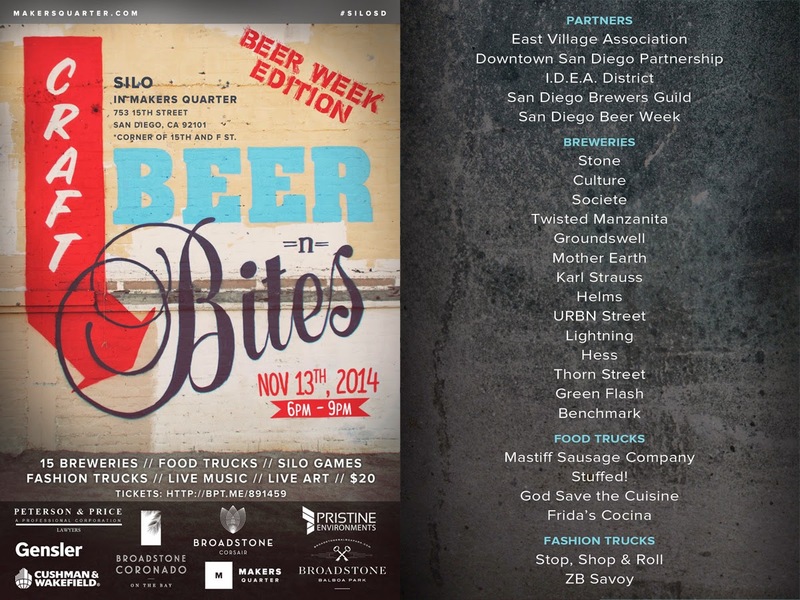 Check out the full list of SD Beer Week events HERE.